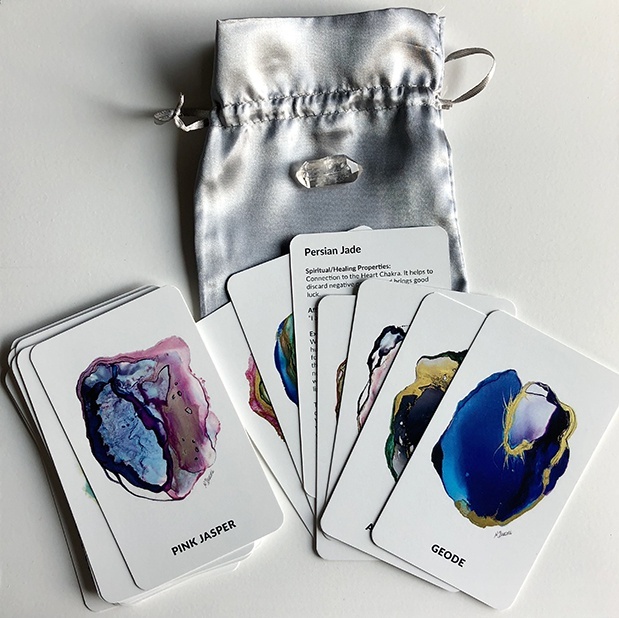 Each Deck comes with a satin bag, 24 Jewel Cards, an Instruction Card and a Quartz Crystal. The Quartz Crystal will cleanse the deck while in the bag as well as offer power and strength as you hold the crystal during your work with the cards. Please remember to practice Self-Love and Self- Compassion always while using the Jewel Cards as well as during your everyday life. The JEWEL CARDS were a collaboration between myself and my talented sister, Kavita Melwani, a Certified Life Coach. We put our hearts and souls into designing this Deck, hoping to bring you inspiration, empowerment and joy. Each card features a Jewel. On a chosen day, you will select one card. On one side you will find one of my Jewel Paintings and on the other side, you will read Kavita’s words stating the Spiritual and Healing Properties of the stone; an Affirmation to guide your day and an Exercise to help you to achieve this affirmation. I love to paint uplifting and magical art for the soul through using bold colors and inviting textures. A blissful day to me would be shopping, going to an art museum and having brunch with my husband and two young boys. I believe life is meant to be lived to the fullest by doing what you love and living the truest version of yourself.